The 50-50 martini is the mix for those who embrace vermouth. It's a twist on the classic gin martini that simply changes up the ratio of the two ingredients. If you enjoy vermouth, you'll find this a nice change of pace and a far cry from the modern custom of using virtually no vermouth. Use the best gin and vermouth you can get for this cocktail and add a dash of bitters for a little extra spark. Likewise, many of the standard martini options will also work here. For instance, shake it if you prefer or pour vodka. You might also enjoy it served with a lemon twist rather than the olive. As long as the ingredient ratio is 1:1, it technically qualifies as a 50-50 martini! In a cocktail shaker filled with ice cubes, pour the gin and vermouth. The best martinis are made with the best gin, so be sure to pour a premium brand. Customarily, it's made with a London dry gin, though there are many fascinating dry gins available that don't fall under that label. It's also a fabulous recipe for gin experiments. If you spot an unfamiliar brand and it piques your interest, give it a try and see how it stands up to vermouth. The quality of the vermouth should match the gin. More importantly, make sure that your dry vermouth is fresh because it doesn't have the long shelf life of distilled spirits. Over time once it's exposed to air, the fortified wine will begin to lose its botanical flavor and become stale. If a bottle's been open for more than three months and has not been stored in the refrigerator, it's time to replace it. 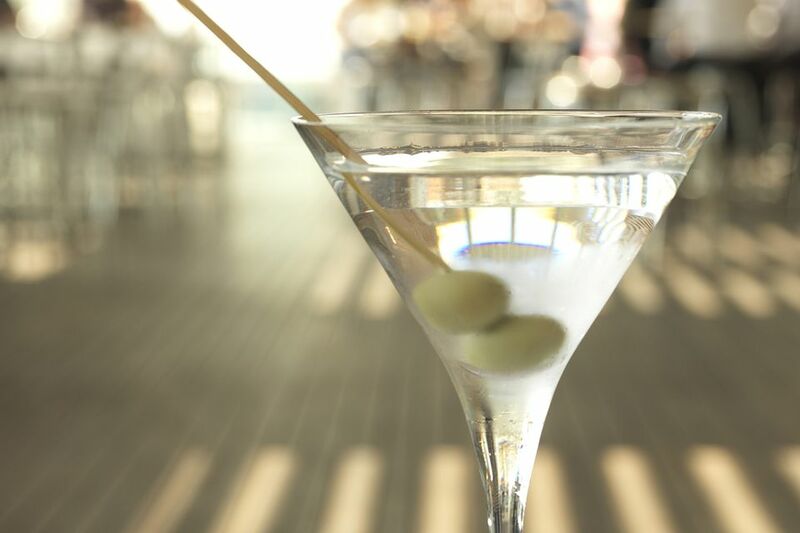 It may just be an old bar superstition, but it's said that an even number of olives in a martini is bad luck. Stick with one or three olives if you don't want to test that theory! An old recipe called the "allies cocktail" is very similar to this one and has a World War II theme. It's a mix of equal parts London dry gin and French (dry) vermouth with 2 dashes of Russian kummel, an obscure caraway, cumin, and fennel liqueur. Having a few friends over for martinis? Mix this cocktail up in a martini pitcher. The tall, thin pitchers are designed specifically for the purpose of stirring up martinis with ice. They vary in size, typically from 25 ounces to 64 ounces, and some even come with an appropriately sized Hawthorne strainer. How Strong Is a 50-50 Martini? As with all martinis, this is a very strong cocktail. It may look all fancy and genteel, but it's potent and will typically mix up to an alcohol content around 24 percent ABV (48 proof). While it's not the potential 62 proof of a dry martini, you will notice the effect if you knock back two or more in one night.